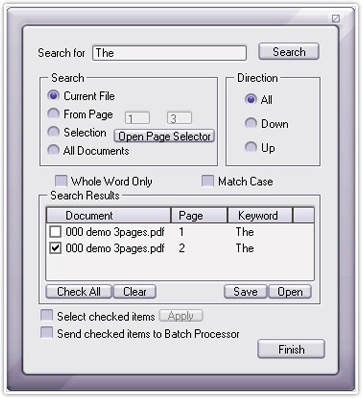 With the search tool of PDFCool Studio, the user can easily achieve the word searching. 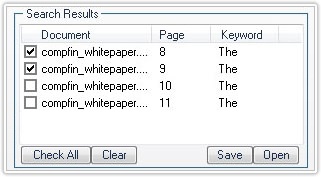 The search scope can be the selected pages of current PDF document; it can also be the selected pages of all PDF documents opened in the program. You can save the search results as a txt document; you can also send the search results to Bath Processor. Type the text you want to find in the "Search for" box. Check the "Whole Word Only" option to search the whole words; Check the "Match Case" option, the search results will distinguish the capitalization. Click on the Open button to import the saved search results. Check the "Send checked items to Batch Processor" option, the checked items will be sent to Batch Processor.